In the early 1880’s, Big Bear Village, Fawnskin, and Big Bear City didn’t exist. The only community in Big Bear Valley was a little mining town at the north/east end of Baldwin Lake called Baird’s town, and the only two roads into the valley were actually trails.The only community in Big Bear Valley was a little mining town at the north east end of Baldwin In order to get to Big Bear, there were only two choices. The first was a burro pack trail that started in the Santa Ana Canyon and ran up the steep mountain slopes behind today’s Snow Summit. This road couldn’t accommodate wagons. The other route was up the steep canyon between Lucerne Valley and Baldwin Lake, where Highway 18 exists today. It was called the Cushenbury Grade. It was a lot steeper back then, and it didn’t actually follow the exact same route that highway 18 does today. However, before you got to the Cushenbury Grade, you first had to travel over the Cajon Pass to Victorville. This was a big deal back then, because the single lane dirt road over Cajon Pass bore little resemblance to the multi lane highway of today. Once you arrived in Victorville, you then had to make the journey across the desert over to Lucerne, and finally up the Cushenbury Grade. A typical trip from San Bernardino to Big Bear Valley via this route took about three or more days. But things were about to change. In 1884, Frank Brown built a rock dam across the narrow west end of Big Bear Valley which created the lake. In spite of the three day journey that it took to get to Big Bear, tourists began showing up almost immediately. In 1888, two local Big Bear ranchers, Gus Knight and John Metcalf, decided to build a resort hotel for those brave tourists. They named it the Bear Valley Hotel, and it was an immediate success. Knight and Metcalf new that Big Bear had the potential to become a popular destination resort, but they needed a better road into the valley. 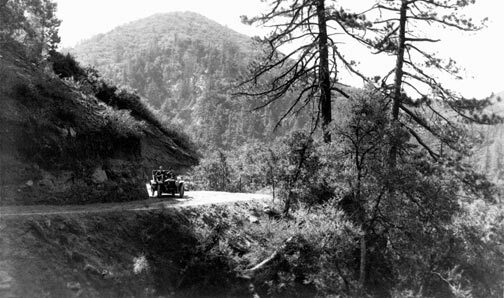 The only real roads into the San Bernardino mountains, at that time, were logging roads built to support the lumber mills scattered across the far west end of the mountains by Lake Arrowhead, Crestline and Running Springs. The Bear Valley Toll Road was the first true wagon road into Big Bear. It ran from Fawnskin, through Holcomb Valley to Runinning Springs. This image was taken at the Green Valley Lake toll booth. Gus Knight traveled to San Bernardino and lobbied directly with the County Board of Supervisors for a new public road to Big Bear which was located about another 25 miles or so farther east of all of the logging roads. The supervisors felt that Big Bear Lake was still wilderness territory, and his request for a public road was denied. The county had no intention of picking up the high cost of building a road to Big Bear just so people could go fishing. 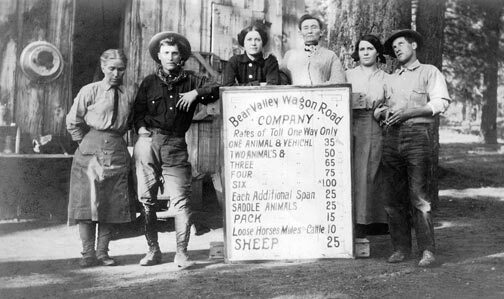 So Knight and Metcalf took matters into their own hands and incorporated the Bear Valley Wagon Road Company in 1891. The new road started in Big Bear at Grout Bay, today’s Fawnskin, went through Holcomb Valley to Green Valley. It then connected with the existing logging roads at the west end of the mountains. The new Bear Valley Wagon Road reduced the travel time to Big Bear to only one and 1/2 days. More importantly it allowed tourists to travel all the way to Big Bear in the comfort of a wagon. This wagon road through Holcomb Valley still exists today, and is maintained by the U.S. Forest Service as USFS 2N68 and USFS 2N13. A 4-wheel drive vehicle or a two wheel drive vehicle with good ground clearance is recommended if you plan to drive this old highway. Since the toll road entered Big Bear valley at Fawnskin, tourists still had to travel all the way around the lake to get to Knights Hotel which took another one and a half or two hours. The new toll road was a definite improvement, but Knight still wasn’t satisfied. He wanted a more direct route. So in 1899, Knight joined forces with a group of Redlands business men, and formed the Bear Valley and Redlands Toll Road Company.They began construction on a new road which started in Redlands, and went up the Santa Ana Canyon through the Hiram Clark ranch.It then switch backed and forth up the steep mountain behind Snow Summit, and entered Big Bear valley just west of Big Bear Village. The infamous switchbacks up the steep Clark’s Grade. It’s hard to believe that this was once the main highway to Big Bear Lake. – Rick Keppler collection. The road eventually became known as Clarks Grade, and like the Fawnskin/Holcomb Valley road, it still exists today. Clark’s Grade was strictly a one lane road, and to avoid bottlenecks and accidents, a timing system was established that regulated the uphill and downhill traffic. A vehicle was only allowed a certain amount of time for uphill travel, then it was required to pull over and wait for a few hours while the downhill traffic went by. For many years, the only way you could travel through the San Bernardino Mountains was on this series of privately owned, poorly maintained, interconnected toll roads. But in 1915, everything changed. 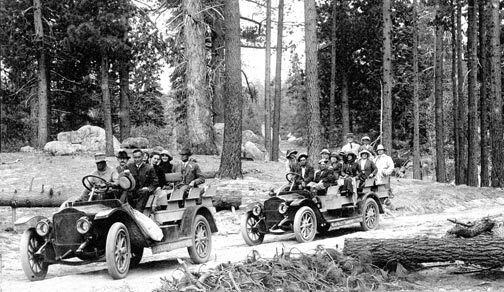 Tourism in the San Bernardino mountains in the early 1900’s, was rapidly gaining in popularity. It was also beginning to generate serious income for San Bernardino merchants. So in 1910, the San Bernardino County decided to build a highway through the mountains. They first purchased Knights Bear Valley Toll Road, and other toll roads in the mountains, including the one at Clarks Grade. They connected them all together, and then set about making major improvements. By 1915, the work was finished and the county had a new public highway that ran from San Bernardino up through Lake Arrowhead, over to Big Bear Lake, and then back down to Redlands. It was called the “Rim of the World Highway”. It was a vast improvement over the old system of toll roads, and the effect of this new highway on the growth of Big Bear was nothing short of phenomenal. In 1913, there had been only two resorts operating in Big Bear. By 1921, after the highway was built, there were over fifty two scattered throughout the valley. An old Model T works it’s way to Big Bear Lake. The Rim Of The World Highway was strictly a summer time road. – Rick Keppler collection. But there were still problems. For one thing, the highway was still dirt, and as a result it was usually closed by snow during the winter months. And the section of highway that ran through Holcomb Valley to Fawnskin was a nightmare to maintain. Locals called it the Snow Slide Road. It was constantly being washed out whenever it rained. In 1923, San Bernardino County decided that it wanted a better route. The route that the county selected for the new highway would bypass Holcomb Valley completely. It was going to run from Running Springs through Snow Valley and then to the dam at Big Bear Lake. Once this new highway reached the dam, it would continue along the north side of the lake to connect with North Shore Drive at Grey’s landing, and then on into Fawnskin. However, when Big Bear Village heard of the new highway connecting at the dam, they immediately demanded that the county petition the water company for an easement to build a bridge across the top of the Big Bear Lake dam, and to build a new road that would run along the south shore of the lake and connect directly to Big Bear Village. The water company gladly granted an easement across the dam. The bridge and the south shore road to Big Bear Village was built in 1924. As to why the water company agreed so quickly to provide an easement across the top of their dam for the bridge is another interesting story that I will be posting later. As a result, travel on the single lane Clarks Grade stopped almost immediately. Just about all the traffic entering and leaving Big Bear began using the Eastwood Dam bridge, and the south shore road to the village. This county highway system was still dirt, but it was now two lanes wide and a lot better engineered than the old toll roads. 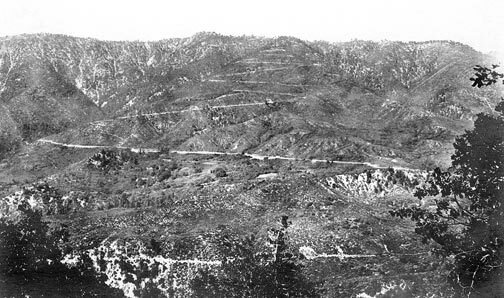 The Rim Of The World highway was eventually paved, and Highway 38 over the Onyx summit to Redlands was built. This turned Big Bear into a year round resort and gave us the system of roads that we have today. Two heavily loaded White Stages, operated by the Bear Valley Transportation Company arrive in Big Bear Lake after a long climb up Clark’s Grade. The powerful, rugged, and dependable White Stage vehicles were the preferred choice of transportation companies for moving tourists into the San Bernardino Mountains. – Rick Keppler Collection.